Expand your child’s imagination while she develops foundational skills in Science, Technology, Engineering and Math (STEM) with this groundbreaking construction toy. Build & Imagine calls on children’s inner designer, architect and director, allowing them to act out adventures in sets they create themselves. Kids stretch their spatial reasoning and storytelling skills, building scenes from illustrated magnetic panels they can combine and creatively furnish with magnetic accessories. Adding to the appeal are adventurous female characters that bring your kids’ stories to life--kids dress them up and move them around in settings like a beach house and a marine rescue center. The sets are collectible and interchangeable. Build & Imagine was inspired by the fact that women hold only 24% of the jobs in STEM fields. Award-winning toymaker Laurie Peterson wanted to address this gap by creating an educational building toy that girls would love. This emphasis on fun makes it easy for kids to evolve their analytical skills without pressing pause on playtime. Hi I am Laurie Peterson, the founder and inventor of Build & Imagine StoryWalls. 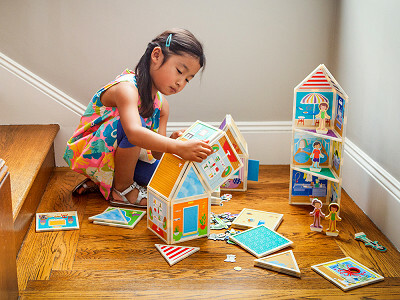 I developed these construction toys after watching a group of girls play with plain colored magnetic building tiles at a museum. They built really cool structures and stepped back to admire them. They looked proud but quickly disengaged with the exhibit. I realized that many girls, as well as boys, LOVE building but need a richer play experience to stay engaged. I am blown away watching kids engage with our sets on so many different levels – building STEM skills like spatial reasoning and problem solving as they combine shapes along with language skills as they whisper stories to themselves and each other. I look forward to answering your questions and am excited to be partnering with The Grommet on our launch. Hi Melissa, the ideal age range is 4-8. Though, that range can stretch on the upper end. It's not recommended for children 3 and under due to the choking hazard. @Mike @Melissa I also wanted to comment that while we were inspired to create building sets girls would love, boys also enjoy these sets! "Day at the Beach" features a boy character and boys often love how the Marine Rescue Center can be a boat or a building. I hope both girls and boys will be inspired to Build and Imagine. Good morning everyone. I am happy to be here to answer your questions. So, I can't get the beach house for my grandson because it only has girls with it. Can you please modify it, or add another one with a boy or boys? He loves building houses, and he is particularly interested in beach houses. He would love this, and he would probably love the girls, but his Dad, the girls, not so much. Thanks. @Jeanne Would you consider getting the Beach House + Day at the Beach so that you can get a boy doll? We have additional boy characters in the works. It's good to hear you think it's important to include on with the Beach House set. LAUrie, are the walls of these sets magnetic? Is that how they stay together? Hi Eileen, yes the walls and pieces are magnetic. That is how they are constructed and customized. @Mike @Eileen Mike is correct. There are magnets along the edge of each shape that allow shapes to attract and form into 3D structures. In addition you can place magnetic accessories on 1 face of each shape. Actually a question. I would like to purchase this for my granddaughter who will be six years old. Which one do you suggest that I start with? @Peter It depends which theme will call to her. If you think she would be interested in all the themes, I recommend starting with Malia's Beach House as it has the most building pieces. Well this has been an awesome launch day. Thanks everybody for the support! Expand your child’s imagination while she develops foundational skills in Science, Technology, Engineering and Math (STEM) with this groundbreaking construction toy. Build & Imagine calls on children’s inner designer, architect and director, allowing them to act out adventures in sets they create themselves. 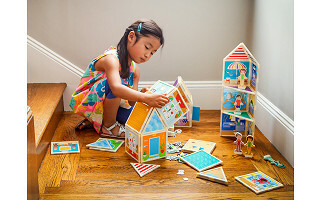 Kids stretch their spatial reasoning and storytelling skills, building scenes from illustrated magnetic panels they can combine and creatively furnish with magnetic accessories. Adding to the appeal are adventurous female characters that bring your kids’ stories to life--kids dress them up and move them around in settings like a beach house and a marine rescue center. The sets are collectible and interchangeable.